FARO, Portugal – The current-generation 7 Series has been around since 2015. 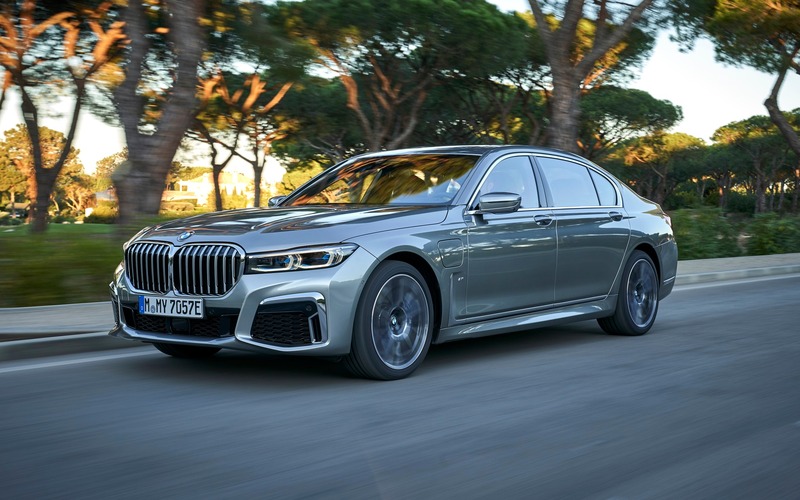 For the 2020 model year, BMW’s full-size luxury sedan gets a technical and cosmetic update that includes new engines, new features and fresh styling. Let’s start with the design, which is more in line with the brand’s latest products such as the 8 Series coupe and the X7 full-size SUV. The signature double-kidney grille is now 40 percent bigger to help the 7 Series make an even bigger statement on the road. This significant tweak is complemented by a redesigned front fascia and thinner LED headlights as standard equipment (Laserlight technology is optional). 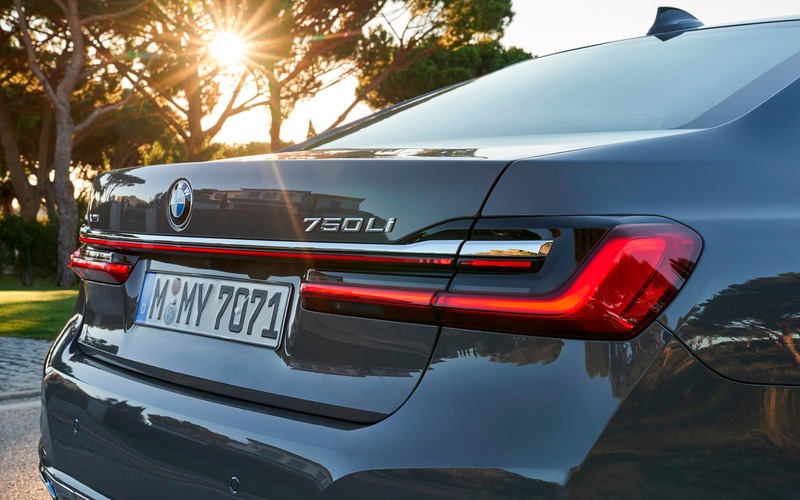 In the back, the redesigned taillights are connected by a light strip to emphasize the big sedan’s width. As a final touch, the new exhaust tips are available with a black or Cerium Grey finish. Inside the 2020 BMW 7 Series, the transformation is more subtle from a design standpoint. The dashboard has the same familiar look, while diamond-quilted leather seats can now be specified. Technology is enhanced through the latest version of iDrive, with customizable menus and an Intelligent Personal Assistant. The latter, similar to Google Home or Amazon’s Alexa, responds to simple voice commands to control the various functions of the vehicle, such as navigation, audio and temperature. 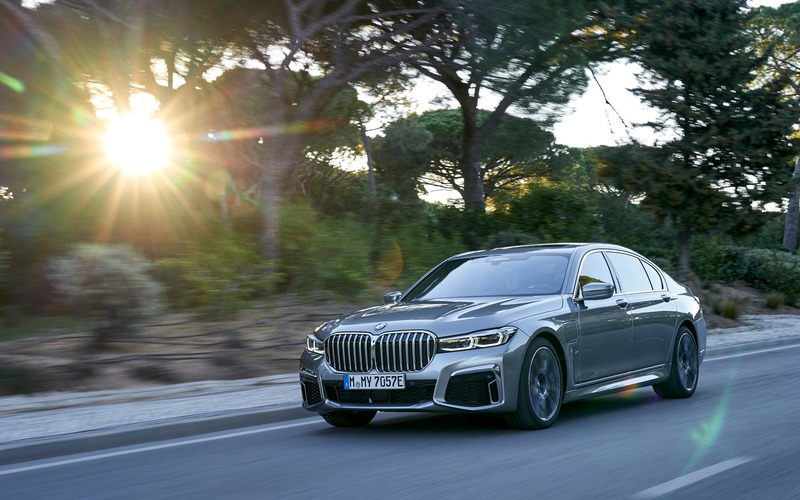 Furthermore, the updated 7 Series comes with a semi-autonomous driving system allowing you to let go of the steering wheel when stuck in dense traffic at speeds of up to 60 km/h—as long as you stay focused on the road ahead. In Canada, the 2020 BMW 7 Series is available in four variants. Three of them ride on a long wheelbase including the M760Li xDrive with a twin-turbo V12 engine, the 750Li xDrive with a recalibrated twin-turbo V8 and finally the 745Le xDrive plug-in hybrid. The fourth variant, called 750i xDrive, has a standard wheelbase and a twin-turbo V8. All receive a new eight-speed automatic transmission (with specific tuning on the 745Le xDrive) as well as all-wheel drive. During the media drive event in Portugal, we had the opportunity to take the 750Li xDrive and 745Le xDrive for a spin. No V12-powered models were on hand, unfortunately, but you can still read our review of the 2018 M760Li xDrive since no changes have been made under the hood. The 4.4-litre V8 did receive a few upgrades, resulting in a gain of 80 horsepower and 74 pound-feet of torque. Now with a total of 523 valiant ponies and 553 pound-feet of torque, the 2020 BMW 750Li xDrive rockets from 0-100 km/h in just 4.1 seconds, which is impressive for a full-size luxury sedan weighing two metric tonnes. Actually, it’s the way the car displays its performance potential that impresses. Takeoffs are remarkably strong, yet the chassis remains perfectly stable with a supreme degree of comfort as the engine unleashes full power and the landscape around you turns into a blur. Thanks to the standard adaptive air suspension with electronic dampers, driving dynamics can be tailored through various modes that adjust comfort and agility. Personally, the Adaptive mode was the most impressive, automatically adjusting its responses to the driving style, steering input, throttle position and selected gear. With this particular mode, the 2020 BMW 7 Series conforms to the pace set by the driver. Long, sweeping corners keep the suspension flexible enough to maintain excellent ride quality, and when the road gets tighter and twistier the car automatically transforms into a skilled athlete, allowing you to brake harder, make lateral transitions quicker and exit corners with more authority. The plug-in hybrid model features a new powertrain consisting of a 3.0-litre inline six-cylinder engine (more powerful than the old four-banger) and an electric motor mated to a 12-kWh lithium-ion battery (previously 9.2 kWh). In Sport mode, total system output amounts to 394 horsepower and 442 pound-feet of torque, good enough to reach 100 km/h in 5.1 seconds. If you do the math, that’s just one second slower than the V8’s acceleration time. 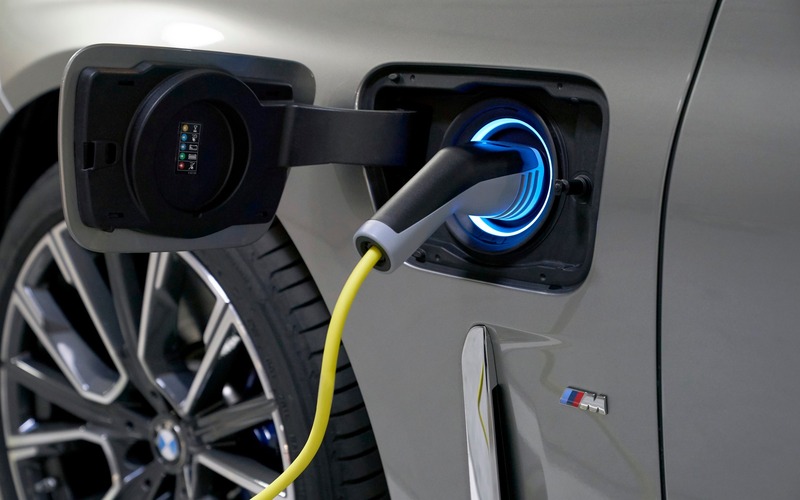 According to BMW engineers, the higher-capacity battery pushes the car’s electric range beyond 50 kilometres in ideal conditions. Top speed in EV mode is rated at 130 km/h. There’s also a Hybrid mode that automatically chooses the energy source to optimize efficiency, and a Sport mode that forces the gasoline engine and the electric motor to work together. Finally, the Battery Control mode preserves the charge for a later use (city driving, for instance) and relies on the combustion engine to replenish the battery on the go. As far as driving goes, the new 745Le xDrive handles just as well as any other 7 Series model. Performance is more than adequate, and the car proves tremendously quiet and comfortable in EV mode. Of course, the main benefit of the plug-in hybrid variant is the ability to use carpool lanes even when you’re alone in the car, not to mention free access to city centres with payment-based traffic restrictions. The 2020 BMW 7 Series models are going on sale in Canada this month. Excluding freight and delivery charges, prices start at $119,800 for the standard-wheelbase 750i xDrive, $126,400 for the long-wheelbase 750Li xDrive, $122,300 for the 745Le xDrive plug-in hybrid and $173,100 for the V12-powered M760Li xDrive. These figures are mostly similar to what customers paid last year. BMW continues to be engaged in a heated battle with Mercedes-Benz for the lion’s share of the lucrative full-size luxury sedan segment in Canada. 7/10	The 7 Series is a heavy luxury sedan that burns a lot of fuel, but the 745Le xDrive plug-in hybrid deserves praise in that regard. 9/10	This car is supremely comfortable in virtually any situation. 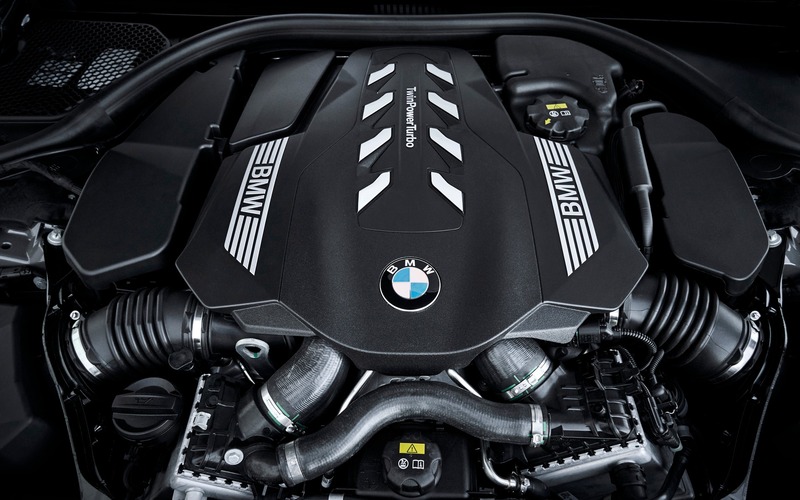 8/10	The twin-turbo V8 (750i) and inline six-cylinder (745Le) deliver convincing performance, the latter just one second slower from 0-100 km/h. 9/10	The latest version of iDrive features configurable menus, although it requires some getting used to. 8/10	The experience is somewhat affected by the car’s heavy weight. 9/10	The looks are rather polarizing, but when it comes to performance and driving dynamics, the 7 Series impresses.